Big-ticket deals buoyed brokerages in 2018, but did the market ‘borrow’ deals from the future? When Hudson Yards opened in the middle of last month, roughly 82 percent of the 8.9 million square feet of office space at the megaproject was already spoken for. “I think it’s much higher than anybody would have ever thought,” said Jeff Peck, a broker at Savills who has done two office deals for tenants in the neighborhood. And that high level of occupancy at Hudson Yards — the joint baby of the Related Companies and Oxford Properties Group — speaks to the strength of the rest of the Manhattan market. The market was buoyed not just by deals at large new office complexes like Hudson Yards and the World Trade Center, but also by transactions at more established towers with companies like media company Bloomberg, Facebook and co-working giant WeWork, now known as the We Company. 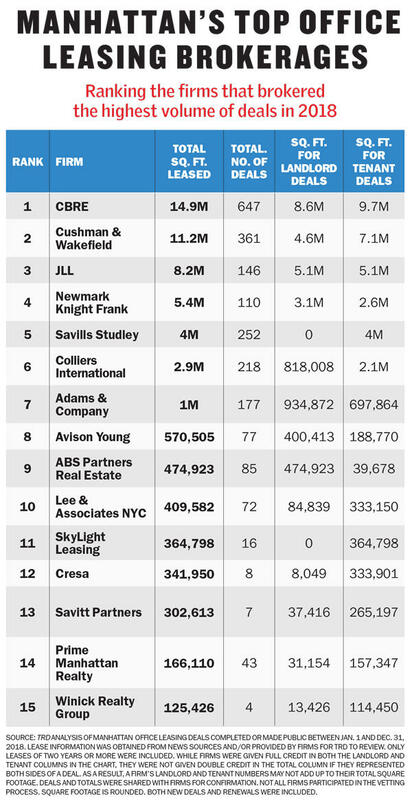 This month, amid that landscape, The Real Deal brings you our annual Manhattan office leasing ranking, which looks at which firms brokered the most square footage of space for all of 2018. To tally the numbers — which included both landlord- and tenant-side deals as well as new leases and renewals — we culled all of the transactions from our own monthly Deal Sheet, scoured news reports and reviewed thousands of leases submitted by firms. CBRE once again topped TRD’s ranking, inking about 14.9 million square feet of deals in Manhattan last year. That was down from about 16.6 million in 2017. Cushman & Wakefield took the No. 2 spot, locking up 11.2 million square feet (down from 12 million), followed by JLL at 8.2 million square feet (up from 6.4 million). Rounding out the top five were Newmark Knight Frank, which brokered 5.4 million square feet (up from 4.6 million) and Savills with 4 million (up about 300,000 square feet). Colliers International, Adams & Company, Avison Young, ABS Partners Real Estate and Lee & Associates rounded out the top 10. Collectively, the top 10 firms inked about 49.1 million square feet — up just 0.8 percent from 2017. But that number reflects the amount of space firms brokered, not the true activity in the market. That’s because if Savills brokered a lease for a tenant, and JLL brokered the same lease for the landlord, both got credit. But the office leasing sector did see strong 2018 numbers overall. According to CBRE, about 38.5 million square feet of Manhattan space was leased up in 2018, with new leases accounting for about 32 million square feet — the highest total since 2000 and 14 percent higher than the five-year average. Despite the strong Manhattan showing, some office leasing players said they’re watching the market closely to see if it can sustain its momentum. “One of the questions that the market will answer over the next year or two is whether ’17 and ’18 were banner years to catch up with below-market leasing volume in ’15 and ’16 — or whether we’ve, as we’ve done in the past, borrowed deals from the future,” said Matthew Barlow, vice chair at Savills. In addition to major relocations from aging Midtown office buildings into new complexes, activity from tech and financial services was a hallmark of the 2018 market, according to multiple brokers. Barlow — whose tenant-focused firm recently leased about 57,000 square feet for asset manager PineBridge Investments at Park Avenue Tower — said tenants are seeking greater flexibility in leases as they start to worry about how long New York’s current economic expansion can last. That has generally meant that they want shorter leases and more contraction rights, which give them the option to downsize before a lease expires. “Tenants are certainly thinking about the defensive position, even if they go out and expand in today’s economic environment,” he said. Franklin Wallach, the senior managing director of New York research for Colliers — which inked 2.9 million square feet in 2018 — cited Deutsche Bank’s 1.1 million-square-foot lease at the Time Warner Center and pharmaceutical giant Pfizer’s 800,000-square-foot lease at Tishman Speyer’s 66 Hudson Boulevard, dubbed the Spiral, as key blockbuster transactions. Those deals were brokered by JLL, which is headed by Peter Riguardi, and Cushman, respectively. In general, activity for leases of 250,000-plus square feet exceeded the five-year average by 50 percent. Deals for space between 100,000 square feet and 249,999 square feet, meanwhile, clocked in 26 percent higher than the five-year average. Among the deals in those categories: Facebook took 317,500 square feet at 770 Broadway and Bank of America signed on for 127,000 square feet at 1114 Sixth Avenue. But Wallach said the majority of deals were still done in the 5,000-to-15,000-square-foot range. “As much as the megadeals make the press, the bread and butter has always been driven by the 5,000- to-15,000-square-foot tenants,” he said. It is difficult to discuss the Manhattan office market these days without getting into co-working. In September, WeWork announced that it had become the largest Manhattan office tenant, with 5.3 million square feet of space. A 258,000-square-foot lease at 21 Penn Plaza put the company over the top. That lease — in which WeWork was represented by JLL — was the fifth most valuable Manhattan deal of 2018, worth an estimated $365 million, according to a TRD analysis. Last year, flexible office firms (otherwise known as co-working firms) made up 12 percent of office leasing volume — up from 5 percent in 2017, according to data from Colliers. By comparison, TAMI — technology, advertising, media and information services — dropped to 19 percent of the market, from 23 percent in 2017. But not all brokerages are buying into the co-working hype. Tim King of the Brooklyn-based commercial firm CPEX said WeWork has buoyed the Manhattan office market, but noted that its presence may be artificially boosting absorption. “If half the building is a co-working space, that’s probably not a healthy environment because you run the risk of half your tenancy leaving one day or being out of business,” he said. Some firms have opted not to do deals with co-working companies. The co-working trend has also led to a “densification” of the office market, said Savills’ Barlow. One executive at a major New York bank, who asked to remain anonymous, noted that companies used to allot an average of about 300 or 400 square feet of office space per employee, but that has recently dropped to less than 200 square feet. And some companies have even started targeting less than 100 square feet, he noted. Barlow said that while there are roughly 250,000 more office jobs in Manhattan now than there were in 2009, the amount of square footage absorbed has been less than expected. Even law firms are no longer placing as much emphasis on space. The white-shoe firm Paul Hastings, for instance, shrank its footprint to 180,000 square feet a few years ago from 240,000 when it moved to the MetLife Building from 75 East 55th Street. “The idea of having a three-window office for a senior partner and a two-window office for a junior partner is beginning to fade away, where it was sort of an anomaly five years ago,” Barlow said. “Getting new or the closest thing you can get to new, that’s really driven quite a lot of the leasing activity that we’ve seen,” said Nicole LaRusso, CBRE’s tri-state research director. In addition to Pfizer’s deal at the Spiral, the trendy high-tech fitness company Peloton took 312,000 square feet at Cove Property Group’s Hudson Commons in a deal brokered by Newmark and CBRE. Meanwhile, CBRE — whose tri-state division is headed by Mary Ann Tighe — brokered a 79,000-square-foot deal for internet analytics company BounceX at One World Trade. And the activity has not been limited to the highest-profile developments. Buildings in more established neighborhoods, such as Flatiron’s 230 Park Avenue South and Midtown’s 390 Madison Avenue, also saw leases for more than 300,000 square feet. Although there’s nothing new about companies looking to upgrade, the amount of reshuffling has increased lately as employers rethink the layout of their workspaces, according to LaRusso. 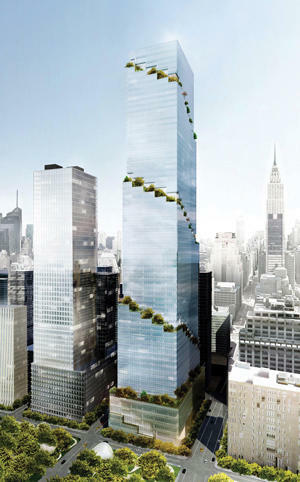 New buildings are also aggressively courting office tenants with more amenities. “Some of these newer buildings also have new bells and whistles. Outdoor terraces are really important,” LaRusso said. Rich Persichetti, vice president of research at Cushman, echoed that point and noted that several tenants are aggressively hunting for newer offices. “Not only have we seen high demand for new product, but we’ve also seen high demand for better-quality product — the Class A space and, more so, buildings that have been recently renovated or updated,” he said. And office tenants are continuing to migrate to Manhattan’s Far West Side, where much of that new product exists. A 2018 fourth-quarter report from Savills ranked the Hudson Yards neighborhood, not long ago a commercial backwater, as Manhattan’s second-priciest office market. Average rents in the neighborhood hit $110.10 per square foot, behind only Plaza North, just south of Central Park. Landlords in newer office markets are, however, still offering discounts and concessions to lure in tenants. Despite Hudson Yards sucking up a lot of the office-leasing oxygen, Midtown — where an area spanning more than 70 blocks was rezoned in 2017 — saw a strong 2018 as well. Tenants leased more than 20 million square feet of office space in the area, the highest since 2000, according to Colliers. 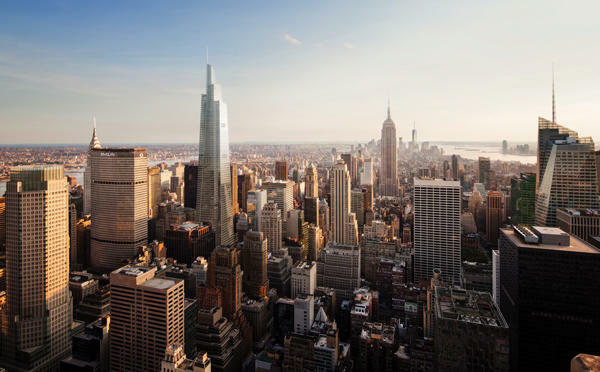 That was largely thanks to new towers like SL Green Realty’s $3.1 billion One Vanderbilt, where TD Securities inked a deal for 119,000 square feet in December and the law firm McDermott Will & Emery signed on for 106,000 square feet last April. “Midtown has finally caught up in offering newly constructed buildings,” Wallach said. Savills’ Peck said that while competition for office tenants in these new complexes will be fierce, it will be even more intense among older buildings. But these aging buildings will still have one key competitive edge: cheaper rents. “If the new space is at $85 a foot and the old space is at $60, that’s always going to appeal to some class of tenant,” said CPEX’s King. Predicting whether there will be enough demand to justify all the new office space coming down the pike is tricky. A report from CBRE found that there are six 1-million-plus-square-foot Manhattan office towers under construction, totaling more than 13.7 million square feet. “Are the gods of real estate creating new tenants that are not in the market today that are going to come in here from Kansas to fill that space?” King said. But CBRE’s LaRusso downplayed that concern, saying that there is still plenty of demand. The last time Manhattan saw an office boom like today’s was back in the 1980s, sources said. But that one, Cushman managing principal Lou D’Avanzo noted, was driven largely by tax incentives designed to make New York a more attractive place to do business. 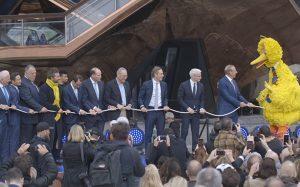 “Today’s buildings are more driven by demand and actual good, solid economics,” he said.